Danielle discovered yoga through studying the Bhagavad Gita, along with other sacred texts, back in the 1970s. She has been practicing yoga on and off since her early twenties, and started teaching yoga in 2002. In 2004, Rain became an Usui Reiki Master/Teacher and was certified by Richard Rudis as a Tibetan Healing Sound Practitioner in 2008. In 2010 she became a Certified Aromatherapist. She has had many injuries over the years (not from Yoga!) and has healed herself of Chronic Fatigue, Fibromyalgia, a herniated disc, and more, holistically. Yoga has played a huge role in all of this — maintaining her health, strength, and emotional/mental/spiritual balance into her sixties. Other unique aspects of Rain’s life experience include: a Buddhist pilgrimage through Tibet; working as a “Ghost Buster”; and sitting a 10-day Vipassana course, in Noble Silence, with 6-10 hours of meditation per day. She continues her spiritual studies and has maintained a meditation practice for close to 40 years. 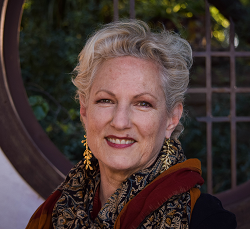 The depth of these experiences come through her work with sound, yoga, and more.